The Voices Foundation is seeking a General Manager who will be responsible for providing senior operational management for the charity. This is an opportunity for an energetic, bright, rigorous and fastidious manager to gain senior management experience in a cultural education charity, impacting on children and young people around the country. The General Manager role is central to the effective senior leadership of The Voices Foundation (VF) and will sit at the heart of the organisation’s small and dedicated team. Supporting the CEO, Rebecca Le Brocq, the role will have a considerable impact on the smooth running of the programmes and activity and operational aspects of the organisation. Read more about the role in by visiting our Work For Us page. In December of 2018, The Voices Foundation Participated in the Big Give Christmas Challenge, the UK’s largest match funding campaign. For 7 days, all donations received through this challenge were generously doubled by John Lewis Partnerships and The Reed Foundation. Thanks to our incredible supporters, we sucessfully reached our target and raised £36,756. This funding will help the Voices Foundation impact more children and young people who are disadvantaged and less likely to engage in the life-changing experience we offer in 2019. The Voices Foundation is very excited to announce that we have been selected to participate in the Big Give Christmas Challenge 2018, the UK’s largest match funding campaign. For 7 days from 12pm on Tuesday 27 November to 12pm on Tuesday 4 December, all donations received through this challenge will be doubled by John Lewis Partnerships and The Reed Foundation. Read the full Press Realease below! The Voices Foundation is celebrating its twenty-fifth anniversary by bringing together children from across the UK to sing at a birthday concert at St. John’s, Smith Square. The charity has commissioned internationally-acclaimed composer David Bruce to write a piece on the theme of ‘homecoming’ for the anniversary concert. The piece, entitled Song of Until, is being taught to children in fifteen schools across the UK by The Voices Foundation’s network of skilled singing teachers. Over 150 children will take part in the premiere of the piece at the concert on 28th November. The Voices Foundation, in partnership with the David Ross Education Trust, is seeking tenders from qualified consultants/organisations in the area of evaluating the impact and outcomes of teacher CPDL on pupil outcomes. The Voices Foundation and the David Ross Education Trust have been awarded a significant two-year Teacher Development grant from the Paul Hamlyn Foundation (PHF). The Teacher Development Fund (TDF) is a new initiative that supports the delivery of effective arts-based teaching and learning opportunities in the primary classroom, and explores how schools embed learning through the arts in the curriculum. We are delighted to announce the appointment of Kathleen Alder, founder and director of WildKat PR, to our Board of Trustees. Kathleen is joining The Voices Foundation at an exciting time and we are incredibly fortunate to have secured her appointment. Click below to read the official press release. provide resources which are more prescriptive so that teachers are empowered to get on with using ready-made resources. The resource will be simple, accessible and immediately useful for teachers. support the MVP and the larger project scope. We will be seeking to hear proposals the week commencing October 8. A pioneering initiative led by The Voices Foundation in partnership with the David Ross Education Trust has been awarded a grant of £150,000 by Paul Hamlyn Foundation’s Teacher Development Fund. The Teacher Development Fund is a new initiative that supports the delivery of effective arts-based teaching and learning opportunities in the primary classroom, and embeds learning through the arts in the curriculum. It aims to support teachers and school leaders to develop the necessary skills, knowledge, confidence and experience to teach non-arts subjects using arts based approaches, supporting children and young people experiencing disadvantage. The Voices Foundation and the David Ross Education Trust share a passionate belief that music acts as a significant agent for school improvement and that it should be central to school life. 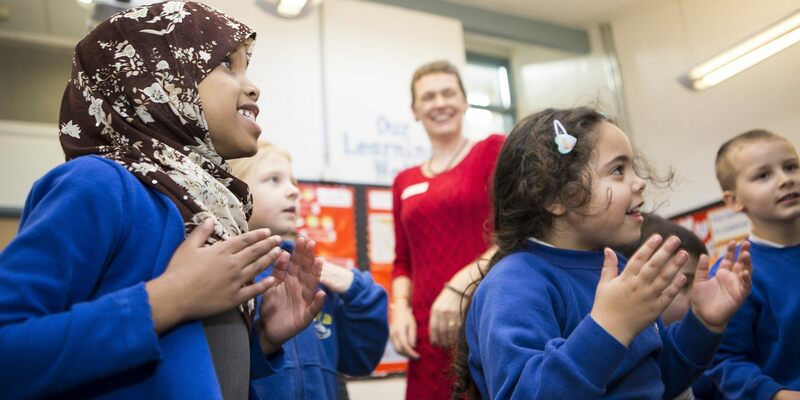 Their programme aims to improve outcomes in literacy, language and communication, cognitive development and behaviour, by developing a whole-school singing culture through CPDL. We are delighted to announce the appointment of Jadis Tillery, strategist at ikwe and a marketing professional with 18 years of global experience, and Felix Meston, Account Director at freud communications, to The Voices Foundation’s Board of Trustees. We are privileged to have secured these appointments at this exciting time in the charity’s development, as we work hard to widen our reach and deepen our impact. Click below to read more about Jadis and Felix. We’re delighted to be leading a session at the Music & Drama Education Expo Manchester on 11 October 2018 entitled ‘Singing Schools: Creating a culture of singing in your school’. Join us at 12:55 in the Workshop Theatre to find out more about this award-winning initiative which focuses on social and musical change for primary schools. The project uses the joy, power, discipline and accelerated learning opportunities afforded by singing to secure better musical, educational and personal outcomes. Delivered by Voices Foundation and the David Ross Education Trust. Our pioneering Singing Schools programme devised in collaboration with the David Ross Education Trust has won the ‘Excellence in Primary/Early Years Music’ Award at the 2018 Music Teachers Awards for Excellence, held at the Sheraton Grand London Park Lane Hotel in Mayfair. The Voices Foundation is delighted to announce that Ed Milner has been appointed to join the management team as Interim CEO in April 2018. This will coincide with the current CEO, Rebecca Le Brocq taking maternity leave from April 2018. The organisation is thrilled that Ed, who has extensive experience of arts education leadership and national singing programmes, will be leading the organisation during this time. Ed has worked in singing education throughout his career as a singing leader, choral director and senior manager. Most recently Head of Music Education at Sage Gateshead, Ed was previously Director of Workforce Development for Sing Up. With a strong belief that all children and young people can and should sing, Ed is delighted to join Voices Foundation. The board, team and practitioners at Voices Foundation look forward to working with Ed over the coming year. During this time, the organisation will continue its important strategic development initiatives, celebrate its 25th Anniversary, develop an Online Teacher Learning Centre and build on its recent successes with the ‘Singing School’ programme which it launched in 2016. Our partnerships with individual schools, multi academy trusts and Music Education Hubs will be central to how we increase our reach and impact over this time. Voices Foundation is currently recruiting at both senior leadership and governance level. Voices Foundation is seeking an outstanding and talented individual with strong business acumen and a passion for music education to fulfil the role of Interim Chief Executive (maternity cover). We are looking for a confident leader who will inspire, motivate and support staff, practitioners, donors and stakeholders. The 10-month period covered by this role (April 2018–February 2019) also falls within Voices Foundation’s 25th anniversary year, and therefore involves some special projects and opportunities for the charity. A Singing Schools programme devised by the Voices Foundation in collaboration with the David Ross Education Trust has been shortlisted for a prestigious music award. Dubbed ‘the Oscars of the arts education sector’, the 2018 Music Teachers Awards have been created by the Music and Drama Education Expo to recognise and celebrate excellence in Music and Performing Arts Education. The Singing Schools programme has been nominated in the Excellence in Primary/Early Years Award category. The Singing Schools programme has been nothing short of transformational: Kings Heath Primary Academy in Northampton, the only school to take part in the project in the programme’s first year, has seen an increase in Year 6 SATs results from 31% combined (reading, writing and Maths), to 64% combined. Following this initial success, and thanks to the vision and ambition of the David Ross Education Trust together with the Voices Foundation, the programme has expanded with a further four David Ross Education Trust primary academies now taking part in the Singing Schools programme. Click on the image below to read the Autumn 2017 edition of our newsletter. 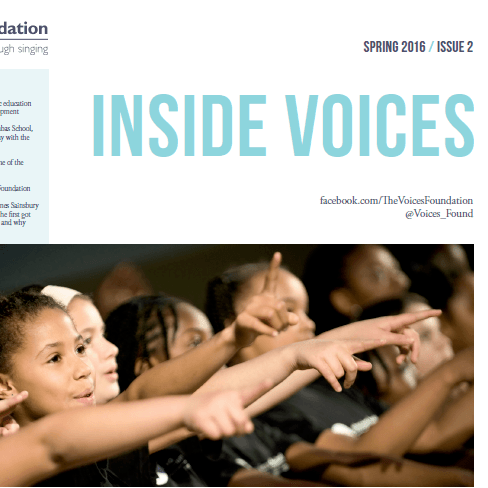 Articles in this edition include How a year of singing has changed everything by Kim Duff, Headteacher of Kings Heath Primary Academy (a Voices Foundation Singing School), and Musical by Design by Prof. Adam Ockleford. As a testament to the school’s musical ambition, pupils from Harris Primary Free School Peckham have already been selected to perform in A Concert for Winter at Shakespeare’s Globe on 7th December. Complete with song, dance, poetry and performance the event will celebrate the borough of Southwark’s rich and diverse talents, and we are delighted that pupils from Harris Primary Free School Peckham will have the opportunity to perform at such an historic and prestigious venue. The Voices Foundation is one of 15 organisations receiving support from Friday Afternoons for the delivery of 'exceptional activity with young people'. This generous support will allow us to encourage children and young people to sing, and inspire and train primary and secondary teachers through key partnerships with DRET Primary Schools, CET Secondary Schools and Sunderland Music Hub. We would like to extend our gratitute to Friday Afternoons for their support. The Voices Foundation will be exhibiting at the Music & Drama Education Expo in Manchester on Wednesday 4th October. Following five successful years in London, the Expo will now open its doors to 500 visitors in Manchester, and we are delighted to have our own Voices Foundation pod there, giving us the opportunity to meet teachers & music education professionals. The day will feature over 20 workshops, lectures, debates and Q&As from award-winning pedagogues, leading practitioners and some of the biggest organisations and institutions in the industry, not to mention ample networking opportunities. We will be at Pod P12 so if you'd like more information about The Voices Foundation, or would like to make the most of special Expo discounts on our courses and books, do come and say hello! To purchase your copy of this award-winning book or to book your place on our 1-day Early Years course with Katie Neilson in March 2018, please visit our shop. And to hear more about how The Voices Foundation could support your school or Early Years setting, email our Learning Manager, Victoria Taylor. We are delighted to announce that we are a finalist in the 2017 Early Years Excellence Awards. Our Inside Music handbook for teachers in the Early Years is being considered for an award as part of the Early Years Music Category. To purchase our Inside Music handbooks, please visit our shop. Priors Court School is this month's Artsmark spotlight school and is being celebrated for this achievement in an article on the Artswork website. The article provides a case study focussed on the school's journey towards achieving their Artsmark award and highlights the Voices Foundation's role in supporting this goal. We are delighted to announce that we are a finalist in the 2017 Early Years Excellence Awards. Our Inside Music handbook for teachers in the Early Years is being considered for an award as part of the Early Years Music Category. More information will follow shortly. The Voices Foundation is delighted to be working in partnership with the Tri-borough Music Hub and a group of consortium partners which has been awarded £100,000 over two years by Youth Music Charity to support music in the Early Years. Thanks to funding from the national charity Youth Music, a trailblazing project is coming to the nursery schools and children’s centres across Hammersmith and Fulham, Kensington and Chelsea, and Westminster. Over the next two years (2016-2018) the project aims to improve the delivery of music for children aged 0-5. It will target work with the teachers in Early Years settings and to help provide more co-ordinated music delivery for children. 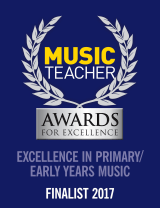 The Voices Foundation was proud to be shortlisted for the Excellence in Primary/Early Years Award at the 2017 Music Teacher Awards for Excellence. With over 13 categories, the Music Teacher Awards are the Oscars of the music education world. At the event over 280 industry guests, including teachers, hub leaders and musicians will celebrate the best and brightest of performing arts education. For more information about the award and our shortlisting click the button below. Huge congratulations go to all category winners! 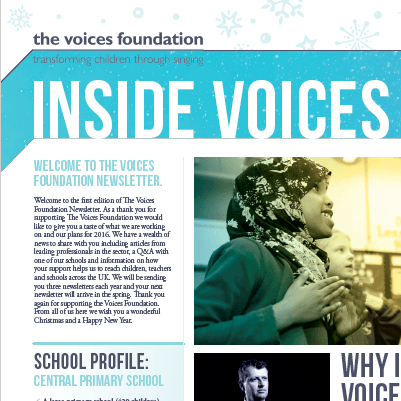 The Voices Foundation has been working in partnership with Central Primary School since 2013. Over this time all staff have taken part in a tailored CPD programme in and out of the classroom, developing their musicianship skills and musical ear. As a result, all teachers deliver regular music and singing in the class room as well as weekly singing assemblies. The school has also developed a choir which regularly performs in the local area.